The session was held by First Deputy to Melitopol Mayor Iryna Rudakova, Deputy Mayor Serhii Pryima, PLEDDG Senior Expert, Head of Experts Group Ihor Lepyoshkin, and PLEDDG consultants Volodymyr Proskurnin and Svitlana Krugliak. 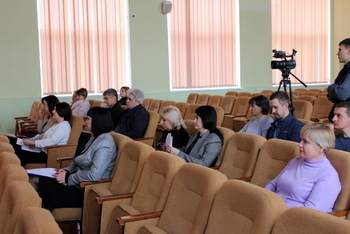 The session also welcomed the participation of managers of structural units of Melitopol City Council and its Executive Committee, and community representatives. Before Advisory Committee started work, Melitopol First Deputy Mayor Iryna Rudakova made a welcoming address to the attendees. 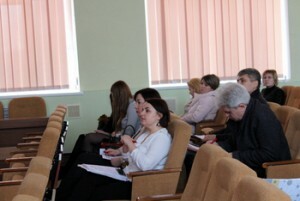 She stressed on the importance of the event and focused on that due to cooperation with PLEDDG Project, Melitopol was implementing a sufficient number of the projects beneficial both for citizens and for Melitopol on the whole. Next speech was delivered by Ihor Lepyoshkin, PLEDDG Key Expert and Team Leader. He noted that the session held that day was a specifically business-oriented event initiated for analyzing the scheduled projects and initiatives for their efficiency and further estimable deliverables. 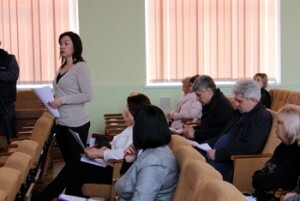 The results of implementation of PLEDDG Project’s initiatives in Melitopol. Analysis of the initiatives and projects which had an impact on the city’s development and would be implemented in future. Action Plan for ensuring sustainability of the results of implementation of initiatives and projects. As an outcome of the meeting further areas and measures to be taken discussed, as well as defined the follow-up steps that would have a positive impact on the development of the projects/initiatives in Melitopol and would be implemented in future. It should be mentioned that Melitopol was selected among 26 candidate cities and became one of 16 participants of the international technical assistance project “Partnership for Local Economic Development and Democratic Governance” which was being implemented by the Federation of Canadian Municipalities and funded by the Government of Canada. This project is aimed at enhancing the state sector, implementation of democratic governance and acceleration of economic development, creating favorable environment for development of small and medium-sized businesses, support of decentralization process and strategic planning. 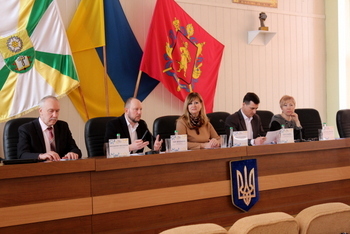 The Memorandum of Cooperation with the Project was signed by the Executive Committee of Melitopol City Council in December 2015 together with participating cities on behalf of Zaporizhia region (Zaporizhia, Berdyansk, and Energodar). PLEDDG-supported, Melitopol approved the program for promotion of products into foreign markets and adopted it at the session of Melitopol City Council of Zaporizhia region in August 2017. To ensure high quality performance and effective control over implementation of the Program’s objectives, there was developed Action Plan, with executors specified. 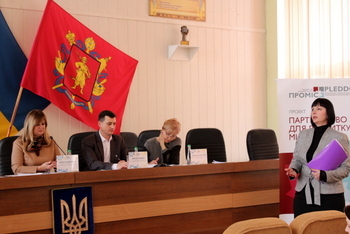 The Melitopol Marketing Strategy was developed as a concept document, which was drafted with PLEDDG support. It was adopted at the session of Melitopol City Council in August 2017. The Plan for implementation, including persons responsible specified therein, was adopted with due regard to the dynamism and necessity of annual adjustment. to make joint efforts for creating eventful and entertaining cultural life and develop an inter-cultural dialogue for attracting tourists and new citizens. Besides, PLEDDG Project provided active assistance in development of Melitopol’s brand: terms of reference to developers and selection of a brandbook’s design team. PLEDDG consultants developed an “Export profile of Melitopol”: there was assessed business climate, availability of resources, defined strategic areas for promoting products of the city’s enterprises, which would allow for enhancing their competitive power both in Ukraine and abroad. Based on the decision of the session, there was adopted “Program for promoting products to foreign markets” developed in cooperation with PLEDDG consultants. Today, with support of PLEDDG Project, the City Development Strategy until 2030 is being developed, and so are gender-oriented budgeting and other initiatives.